When a movie becomes its year’s biggest hit, it almost always spawns a sequel – unless it’s a sequel/prequel itself, of course. Other exceptions tend to stem from films that don’t offer logical reasons to go on – after all, stories like Titanic and Saving Private Ryan don’t naturally lend themselves to continuation. Some films that lend toward sequels do avoid that trend, though. 30 years later, I remain surprised we never got a second Top Gun film, and the fact 1996’s megahit Independence Day didn’t quickly spawn a sequel seemed illogical. Given the nature of the alien invasion motif, new chapters made perfect sense. 20 years later, Independence Day finally spawns a sequel via 2016’s Resurgence. I’d love to say it was worth the wait, but Resurgence fails to live up to the first film’s thrills. In the 20 years since the citizens of Earth defeated an invading alien attack, scientists used the extraterrestrial technology to advance society and beef up defenses. This leads to a unified, happy global community. Until the aliens knock at the door again. Bigger, badder, and madder, the space monkeys come back for revenge and offer a new threat to mankind’s survival. One note of controversy related to Resurgence came from the absence of Will Smith, one of the original flick’s lead characters. From what I heard, Smith would’ve returned for Resurgence but he wanted more money than the producers would commit to him. Would this have helped the movie’s bottom line? Maybe, maybe not. After a long run of hits, Smith’s box office clout faded a few years back – sure, 2016’s Suicide Squad did well, but I don’t think Smith acted as a considerable factor in its success. 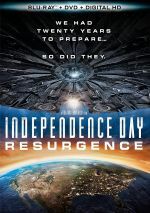 Resurgence made a highly lackluster $103 million in the US – more than $200 million less than the first movie, even before adjustment for inflation – and I don’t know how much Smith would’ve helped in terms of money. Creatively, though, I think he would’ve been an asset, as the movie lacks any charisma. The actors new to the series boast talent in their own right but they seem dishwater dull here, and the film misuses the returning performers. I make no apologies: I liked the original Independence Day a lot. Sure, it was stupid but it boasted a lot of action and became well-executed for what it wanted to be. Resurgence, on the other hand? The plot offers a mushy mishmash of nothing and the characters seem bland as can be. Not only do we fail to care about the new roles, but also we don't invest in the old ones, either. I also feel bothered that the movie brings back one 1996 character solely to be killed off. This person does next to nothing in the film until death occurs, and it's clear that scene exists solely for cheap "emotion" - emotion that doesn't result. The last 15 minutes of Resurgence manages to be moderately exciting, but the rest is pretty slow and sleepy. Even with all the big action scenes and the potential for impactful drama, the movie just doesn’t give us anything that packs a wallop. It doesn’t help that Resurgence lacks a concise ending. Though a big event occurs, the film’s finale firmly pushes toward a next chapter and lacks the sense of completion found with the first movie. That choice would be frustrating under the best of circumstances, but given the movie’s flat box office performance, a third Independence Day seems unlikely. Assuming we don’t get another chapter, the unresolved manner in which Resurgence “ends” means we find a cliffhanger that will never conclude. Memo to filmmakers: unless you’re 100 percent sure you’ll make another film, don’t go for an open-ended finale. At least Judd Hirsch finally appears the age they wanted him to be in the first movie. Actually, without all the old age makeup he wore in 1996, Hirsch looks younger here! Overall, Resurgence disappoints. The movie comes with a rambling plot, bland characters who go nowhere and an essential lack of drama or excitement. 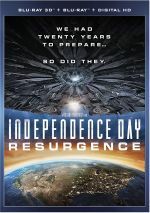 The sequel comes out a good 15 years too late and doesn’t reinvent the Independence Day franchise in a satisfying manner. Independence Day: Resurgence appears in an aspect ratio of approximately 2.40:1 on this Blu-ray Disc. Overall, the image seemed satisfying. For the most part, the movie exhibited good delineation. Though I thought some interiors could be a little soft, the film usually gave us solid sharpness. Neither jagged edges nor moiré effects appeared, and I saw no signs of edge haloes or print flaws. To the surprise of no one, Resurgence provided a palette focused on orange and – especially – teal. These hues seemed uncreative but the movie depicted them in a positive manner. Blacks were dark and tight, while low-light shots offered appropriate clarity. The movie gave us a nice presentation. Even better, the DTS-HD MA 7.1 soundtrack of Resurgence added a lot of kick to the proceedings. With all sorts of mayhem and action, the mix opened up to use all the channels on a frequent basis. These created a vivid soundscape that immersed us in the material to create an involving experience. Audio quality seemed solid as well, so dialogue was natural and well-integrated. Music sounded bold and full, while effects packed a strong punch. These elements showed good definiton and contributed excellent low-end response. The soundtrack suited the story and added a lot to the tale. This package includes both 2D and 3D versions of Course. The picture comments above address the 2D edition, but I also want to talk about the 3D image. In terms of visual quality, the 3D picture looked fairly good. As usual, it displayed a little weaker definition and slightly darker low-light shots, but any degradation remained minimal. Overall, the 3D visuals nearly equaled those of its 2D counterpart. As for the 3D imagery, the movie worked well when it focused on flying elements or items in the air/space. Scenes that emphasized general depth/dimensionality appeared somewhat flat – so it was good that Resurgence offered so many sequences that gave us objects in flight. While I didn’t think this was a great 3D conversion, all those movement shots gave the visuals kick and made it a reasonably solid way to watch the film. All the set’s extras appear on the 2D disc, and we open with an audio commentary from director Roland Emmerich. He provides a running, screen-specific look at story and character issues, cast and performances, locations and sets, various effects and related topics. Prior Emmerich commentaries tended to be dull, and this one seems no different. Emmerich often does little more than narrate the film, and the facts he provides usually lack much real depth or insight. Expect a slow, semi-tedious chat here. Eight Deleted Scenes run a total of eight minutes, 24 seconds. In addition to an alternate opening, these clips tend to offer minor expansions of supporting characters – and we see the White House get destroyed again ala the first movie. Some offer minor moments of interest but I can’t claim any stand out as memorable. We can view the scenes with or without commentary from Emmerich, as he gives us basics about the cut footage. He fails to add much. A featurette called The War of 1996 fills five minutes, 11 seconds. It views the movie events as real and brings us up to date on what happened in the 20 years between movies. It acts as a nice way to fill in gaps left by Resurgence - I’d recommend that viewers watch “War” before they take in the feature film. It’s Early, ABQ! goes for three minutes, seven seconds. A segment of a mock local TV chat show, the Julius character promotes his book. Fred Armisen plays the host, and both Judd Hirsch and Jeff Goldblum reprise their movie roles. “Early” offers a hoot and effective promotion – if Resurgence showed half the cleverness of “War” and “Early”, it would’ve been a much better film. 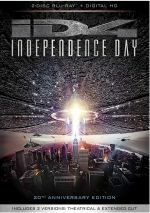 Next comes a 14-part documentary called Another Day: The Making of Independence Day: Resurgence. All together, the program fills a total of 55 minutes, 25 seconds and includes comments from Emmerich, Goldblum, Hirsch, producer/writer Dean Devlin, producer/composer Harald Kloser, co-producer/visual effects supervisor Volker Engel, production designer Barry Chusid, executive producers Larry Franco and Carston Lorenz, vehicle design art director Ron Mendell, art director Crista Monroe, special effects technician Allen Pike, art director Clint Wallace, writer Nicholas Wright, general foreman Joe Montenegro, director of photography Markus Forderer, and actors Bill Pullman, Liam Hemsworth, Brent Spiner, Jessie Usher, William Fichtner, Vivica A. Fox, Maika Monroe, DeObia Oparei, and Charlotte Gainsbourg. “Day” examines the long path to a sequel, story/characters, cast and performances, set/production design, creatures and ships/technology, various effects, stunts and action. “Day” covers the production in a reasonable manner, but it lacks depth. The program feels more puffy/promotional than I’d like – we learn a fair amount about the flick but “Day” doesn’t use its running time as efficiently as I’d like. A Gag Reel takes up six minutes, 14 seconds. Much of it shows the usual goofs/giggles, but it adds enough improv bits to become worth a look. Under Concept Art, we get stills broken into five areas. These look at “Aliens” (69 stills), “AI” (8), “Humans” (35), “Locations” (18) and “Original Presentation Images” (17). These add up to a good collection of elements. The 2D disc opens with ads for Assassin’s Creed, Deadpool and X-Men: Apocalypse. We also get two trailers and a TV spot for Resurgence. After 20 years, the Independence Day franchise returns with the proverbial whimper. Though a few scenes offer decent excitement, too much of the movie seems muddled and free from thrills. 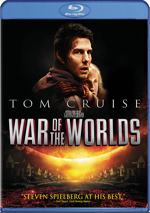 The Blu-ray brings us pretty good picture as well as excellent audio and a moderately informative set of supplements. I like the original film but Resurgence ends up as a definite disappointment.